ooooh ok I dont think I had read about that. So all of the tracks are duets?? I got the impression from previous posts on here that they're all duets, so fingers crossed. That's the way I understood it too, G, so if you've got the wrong end of the stick, so have I! Hopefully, we'll find out soon enough! Even better! Moya duets with all those artists It's like Christmas! It's called "Music of Ireland: Welcome Home". It's available from Barnes & Noble here. It looks like the CD & the DVD come together. Thig crioch air an t-saoghal, ach mairidh ceol agus gaol. The world will come to an end, but music and love will endure. I wonder is this the track she did with Shane Mc Gowan a few years back? say "muusical journey" sounds kinda "maaagical journey"
to me,sorta fairytale makes me smile. Just seen the new front page for the website. Veeery nice Moya and Tim! Thanks Really made me smile - I needed that! Oh, I love the new front page! And new tour dates were announced! Here's hoping that I can make it to a show this spring! I was very excited when Moya tweeted about the PBS show. I just bought the companion CD/DVD at Barnes and Noble, too. It's such a wonderful way to get Moya's music heard by a lot of people in America. A_S wrote: Oh, I love the new front page! This CD is a great news. I'll buy it, for sure!!! Steve wrote: I was very excited when Moya tweeted about the PBS show. I just bought the companion CD/DVD at Barnes and Noble, too. It's such a wonderful way to get Moya's music heard by a lot of people in America. Track 13: Is Mise 'n Ghaoth/The Lass of Aughrim (with Anúna & ft. Iarla Ó Lionaird). 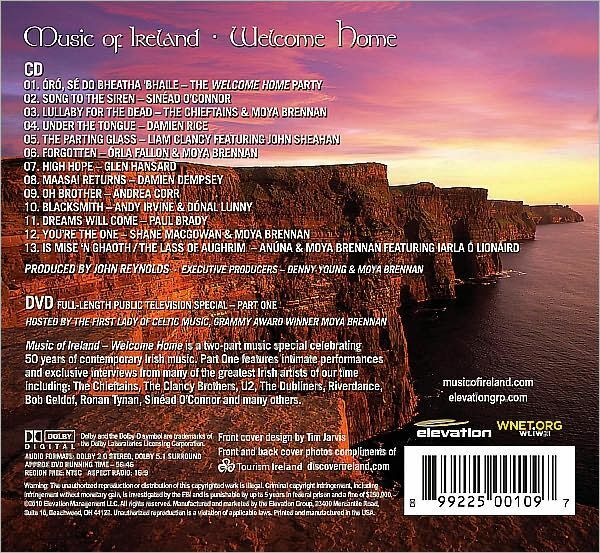 But the entire DVD of Part 1 of Music of Ireland: Welcome Home is included. I believe it states Region Free, NTSC 16:9 aspect ratio, Dolby 2.0 stereo and Dolby 5.1 surround.